Carlton Ware was a pottery manufacturer based in Stoke-on-Trent. 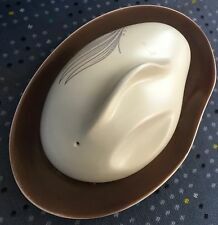 Lovely butter dish with an unusual curved shape. The lid is in very good condition, but the base has signs of wear, most would be covered by the lid. There are also lighter ‘spots’ around the edge of the base. THREE CARLTON WARE DHAPED DINNER PLATES IN WINDSWEPT PATTERN PALE CREAM AND BROWN HAND - PAINTED. 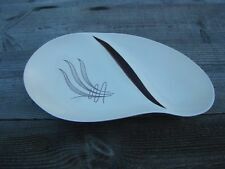 Buy It Now on this lovely leaf design tray by Carlton Ware England. 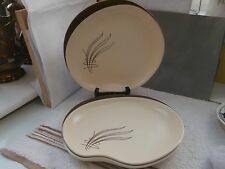 Tray is cream with brown leaf design. This is an Australian design (backstamp carries detail - see final photograph). Fully backstamped with Carlton Ware mark (see final photograph for backstamp). A marvellous opportunity to acquire a complete Retro Carlton Ware dinner service. The set is in generally very good condition and most pieces in Excellent condition and the only obvious wear is crazing to a few of the saucers and a minor chip to a single piece (a small dish). 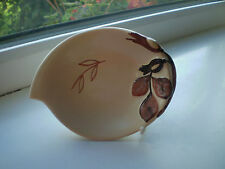 Vintage Carlton Ware Windswept Preserve Pot and Lid. Height with lid in place is 9cms. Lovely salad dish with an unusual curved shape. There is a small chip on the underside of the base dish, which is just visible on the surface. This can be seen in the photographs attached. Beautiful, flowing reed and water Australian design. PLEASE NOTE: HOLIDAY DATES! I’M AWAY 6th FEBRUARY to 28th FEBRUARY 2019. I AM UNABLE TO POST DURING THIS TIME. APOLOGIES FOR ANY INCONVENIENCE. Two Carlton Ware embossed Dishes; in the Australian design. Larger Dish = 24cm x 16.5cm Small Dish = 12.5cm x 9.5cm Both in very good vintage condition. No Chips, no cracks, no hairlines, no pattern loss, no crackle. SHAPED LIKE A BREAD ROLL. 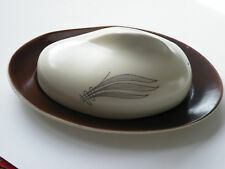 Carlton Ware Boxed Individual Preserves Dish & Ceramic Spoon. Australian leaf design cream body, stylised brown leaves and brown trim. Presented in original Carlton Ware box. Dates to circa 1930's. Looks unused. Base has Blue Carlton Ware Wiltshaw & Robinson Stamp together with Reg Number--488460.